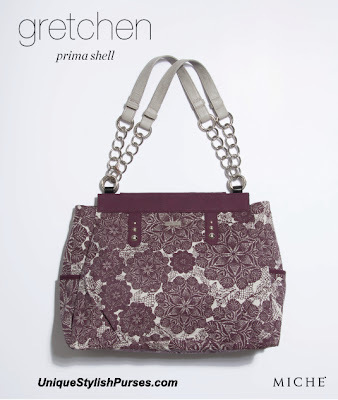 Abstract flowers in a gorgeous shade of deep plum dance across a light grey background, making the Gretchen Shell for Prima Miche Bags an instant head-turner. Exquisite detailing adds an extra dash of class. Printed canvas is accented with plum faux leather and oversized silver dome-head studs. Side pockets.